Pop quiz, hotshot: Your best friend is having a "Star Wars"-themed costume party, and you want your Luke Skywalker costume to be really, really authentic. How much is it worth to you to know you've got exactly the right pair of pants? $36,000, perhaps? Well, someone believes Luke's pants are worth that much, and they've written the check to prove it. Nate D. Sanders, an online auction house, sold the off-white cotton pants Mark Hamill wore as Luke in the original 1977 "Star Wars" to an unnamed bidder Wednesday for $36,100, as part of a sale devoted to Hollywood collectables. 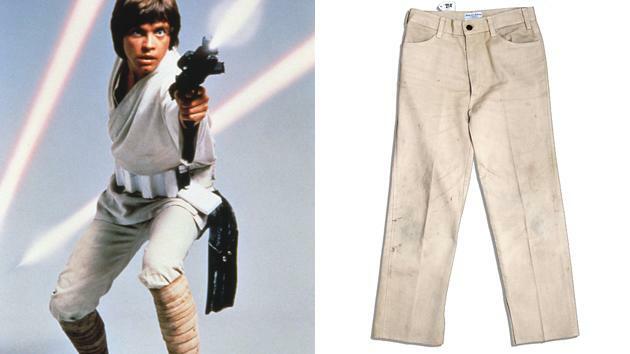 The trousers, described in Sanders' listing as "Mark Hamill's Screen-Worn Hero Pants in the Original 1977 'Star Wars' as Luke Skywalker" (Hero pants! We want some of those! ), have been verified as the very same pair Hamill wore in his breakthrough role. The pants have been on the auction block before; the previous owner won them bidding at Sotheby's in 1998, and they'd previously been sold through Christie's. While $36,000 may sound like a high price for a pair of Levi's no matter who wore them, it looks like the auction winner got a relative bargain. Sanders had initially estimated that the jeans would go for between $70,000 and $100,000, and the X-Wing flight suit Hamill wore in the same movie (as well as "The Empire Strikes Back") went for $60,000 in 2005. The most valuable "Star Wars" clothing item, judging from price paid to date, would be Obi-Wan Kenobi's cloak, which changed hands for a cool $95,000 at an auction in 2007. Whoever bought Luke's pants might want to start hitting the gym if they ever want to wear them – Hamill had a slender 29-inch waist at the time, which would be an awfully snug fit for most fanboys. Hamill once said in an interview, "Those pants I wore [in 'Star Wars'] were just bleached Levi’s with the tag still in them," meaning it’s not that difficult or expensive to duplicate the basic item. But before you head out to the store, keep in mind the jeans Hamill wore were, as Sanders put it, "purposely distressed to display wear, with dirt to back right pocket and in spots to front of pant legs."